Dentists can usually spot a soda drinker. These patients are often prone to dental cavities and white spots on their teeth known as decalcifications, which are actually the start of new cavities. A cavity is an infection caused by a combination of carbohydrate-containing foods or beverages and bacteria that live in our mouths. Sweetened soda contains a high amount of sugar, a carbohydrate that can promote cavities. 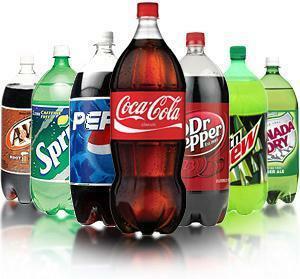 Soda may be even more damaging to the teeth than other sugar containing beverages because it is acidic as well. Before we drink a sugar-sweetened soda, the pH in our mouth is about 7.0, which is slightly more acidic than water. When the bacteria in our mouths are exposed to sugar, they metabolize it and produce acid. The acid causes the pH on the tooth surface to drop. At a pH of 5.2 or below, the acid begins to dissolve the hard enamel that forms the outer coating of our teeth. Over time this leads to erosion that causes cavities and painful toothaches! A study examined the effect of several types of sweetened soda and mineral water on the teeth. Teeth exposed to cola, orange and lime soda had significantly more decalcification than those exposed to mineral water. Of all of the sodas tested, cola caused the most decalcification. Sweetened soda seems to damage teeth in two ways. The soda has a low PH and makes the mouth acidic, and the sugar content promotes tooth decay when it comes into contact with bacteria in the mouth. The easiest way to prevent cavities is by brushing your teeth at least three times a day, especially after eating or drinking and before bed. Reducing the amount and frequency of eating sugary foods and beverages can decrease the risk of forming cavities. If you have to have sweetened soda, it is better to drink it at one sitting than sip it throughout the day. Better yet, drink it through a straw in one sitting, to bypass the teeth altogether.